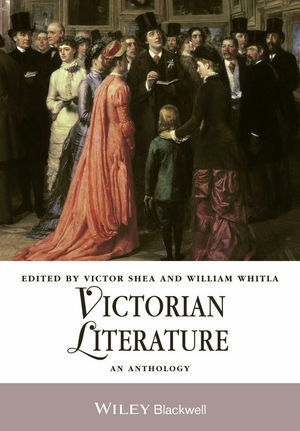 Victorian Literature is a comprehensive and fully annotated anthology with a flexible design that allows teachers and students to pursue traditional or innovative lines of inquiry – from the canon to its extensions and its contexts. Victor Shea is Associate Professor of Humanities and English at York University, Canada. He holds degrees from University of Prince Edward Island, University of Toronto, and York University. His research interests include Victorian culture and literature, British Empire and imperialism, American Studies, and literary theory. With William Whitla, he is co-editor of Essays and Reviews: The 1860 Text and its Readings (2000) and co-author of Foundations: Critical Thinking, Reading, and Writing (2nd edition, 2005). William Whitla is Professor Emeritus and Senior Scholar in English and Humanities at York University, Canada. He holds degrees from University of Toronto, TrinityCollege, and University of Oxford. His research interests include Victorian culture and literature, literary theory, and interdisciplinary studies in medieval and Renaissance studies. He is the author of The English Handbook: A Guide to Literary Studies (Wiley-Blackwell, 2010). With Victor Shea, he is co-editor of Essays and Reviews: The 1860 Text and its Readings (2000) and co-author of Foundations: Critical Thinking, Reading, and Writing (2nd edition, 2005).